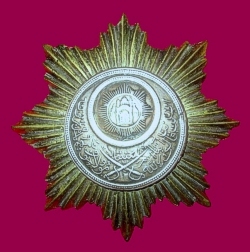 The Order of the Durrani Empire - 1st class, breast star. 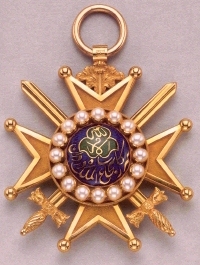 Nishan-i-Daulat-i-Durrani (the Order of the Durrani Empire): founded by Shah Shuja in 1839 and awarded in three classes (1. 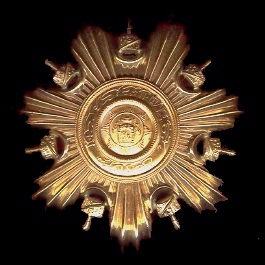 Grand Cross, 2. Knight Commander, and 3. Companion). Closely moddeled on the military division of the British Order of the Bath and conferred on a number of officers of the Bengal Army. Became obsolete in 1842. 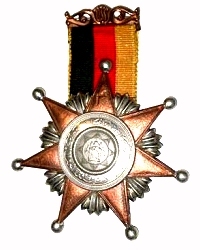 The Order of the Durrani Empire - 2nd class, breast star. (L) and sash badge (R). Grand Collar, sash & sash badge, breast star, collar and collar badge. 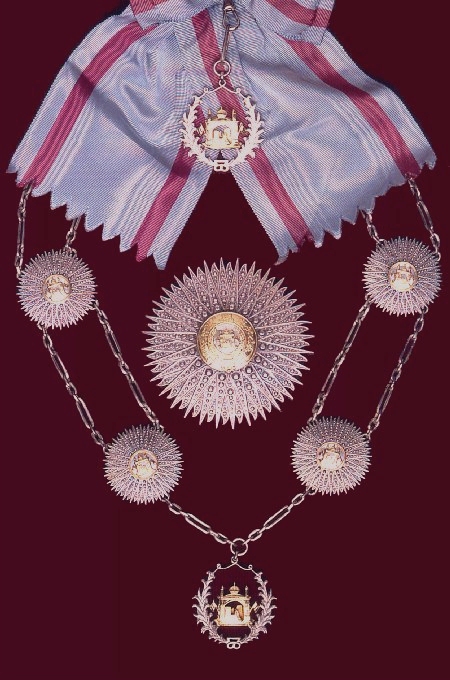 The Order of the Leader - First Class (civil) or Sardar-i-Ala, breast star (A) and sash badge (R). 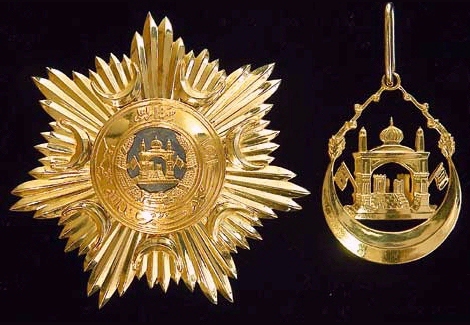 The Order of the Leader- Second Class or Sardar-i-Ali, breast star military (L) and civil (R). 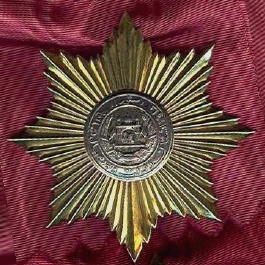 The Order of Independence - Second Class, breast star. 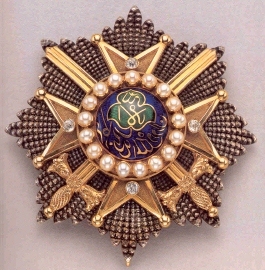 The Order of the Star (King Muhammad Zahir Shah) - First Class, breast star (L) and sash badge (R). Nishan-i-Loi Khan (the Order of National Service): founded by King Amanu'llah 1919, as a reward for patriotic services, the promotion of national unity and internal progress. Not awarded to foreigners. Recipients were entitled to grants of land. 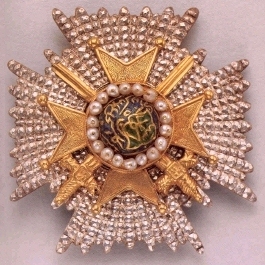 The Order of National Service - First Class, breast star (L) and Third Class, badge (R). 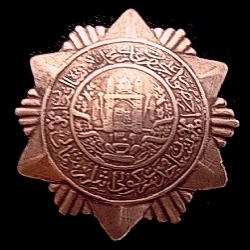 Nishan-i-Shuja'at (the Order of Military Gallantry): founded by King Amanu'llah in 1919, as a reward for gallantry in the field. Extended to five classes in 1923. 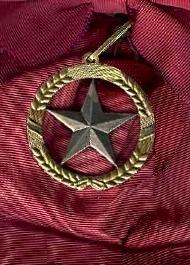 The Order of Military Gallantry - breast badge. Nishan-i-Kidmat (the Order of Service): founded by King Habibu'llah Shah before 1906, as a reward for faithful services to the nation. Awarded in one class and one medal. Nishan-i-Hurmat (the Order of Esteem): founded before 1906. Awarded in one class only. Obsolete 1919. 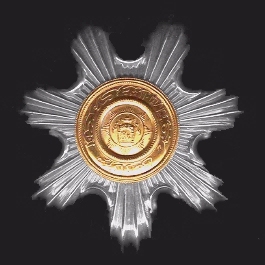 Nishan-i-Bahadur-i-Afghania (the Order of Afghan Honour): founded by Amir Abdu'r Rahman before 1901. Awarded in one class only. Obsolete 1919. 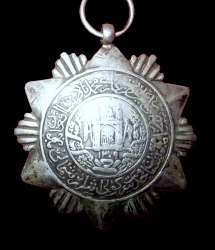 Nishan-i-Izzat-i-Afghania (the Order of Afghan Dignity): founded by Amir Abdu'r Rahman before 1901. Awarded in one class only. Obsolete 1919. 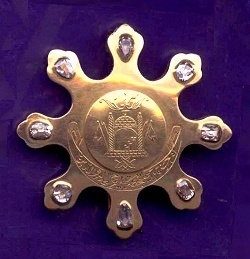 Nishan-i-Taj-i-Afghania (the Order of the Afghan Crown): founded by Amir Abdu'r Rahman before 1901. Awarded in one class only. Obsolete 1919.